Choosing the right bathroom materials is critical to avoid water damage! Sometimes you may find that the beautiful stone tile in your bathroom has possibly led to water damage. 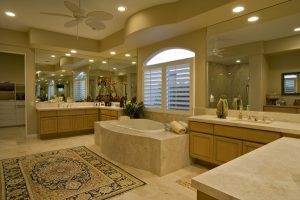 Most often, there are ways to protect your bathroom from suffering water damage and leading you to replace your beautiful tiles. Some materials are considered to be waterproof while others are water resistant. There is a significant difference among the two. Water resistant materials do not deform or become damaged as a result of excess moisture, however, water can still pass through. On the other hand, waterproof materials can prohibit water from seeping out. Even the greatest tile, tile adhesive or tile grout will never be waterproof. They are all typically just water resistant. By using tile in your bathroom you simply create a water resistant material which will be able to withstand water and moisture without needing to be replaced. However, the tile will not be able to prohibit water from seeping through. Although moisture resistant, green plasterboard is unable to prohibit water from seeping through. Green plasterboard is not a waterproof material. As such, it cannot resist moisture. All green plasterboard can do is withstand moisture without altering it. If your bathroom is suffering from a severe water damage event, green plasterboard may end up altering shape and deforming. This can cause severe leakage problems in your bathroom. The simple solution is to avoid using green plasterboard where you have tiles to avoid serious water damage. Plywood has been used to build substrate in bathrooms in the past. However, it is not a reliable use as a substrate if you want to avoid water damage in your bathroom. It can cause massive complications for homeowners. Furthermore, plywood is known to expand when it is wet causing it to leak through any laminate or tile that surrounds your bathroom. Since the tile is not waterproof, it can start to peel off, causing a problem in your bathroom. This entry was posted on Friday, February 10th, 2017 at 12:11 pm. Both comments and pings are currently closed.